MDC Alliance leader Mr Nelson Chamisa yesterday said he was young and could impregnate any woman to prove how energetic he was in yet another show of sexism. The misfiring MDC-T faction leader recently pledged to give President Mnangagwa his 18-year-old sister if he manages five percent in this year's harmonised elections. Chamisa's remarks sparked outrage from Zimbabweans across the body politic. He apologised last Thursday for his sexist remarks saying: "If anyone felt hurt about the joke I am sorry. It was just a political banter that I used to illustrate that even if I promised to give him (Mnangagwa) my most prized possession, he would still not be able to defeat us in a free and fair election." But yesterday, Mr Chamisa repeated the sexist remarks while addressing a rally at Maboleni Business Centre in Lower Gweru. "As we go to an election this year, we must say goodbye to old age leadership. We want young and energetic leaders like me. Is there anyone who can doubt that I am energetic? Just give me any woman here and see if I will fail to score," said Mr Chamisa. The increasingly gerontophobic MDC-T faction leader is accused of leading a campaign to marginalise perceived old people in his side of the MDC and this week incumbent MP for Harare West Jessie Majome opened up about the abuse she was being subjected to that saw her withdraw from the party's primary elections. Ms Majome said she had been told that she was old and should retire to the countryside to herd donkeys. Mr Chamisa, who was addressing a gathering that largely comprised Ndebele speaking people and added: "You think I don't know Ndebele? You are wrong. Totally wrong! I can propose love in Ndebele." Ironically, Mr Chamisa said it was difficult to lead a nation without seeking advice from the elderly. "We have our elderly people like the ones standing with me here. "You cannot lead a nation without taping wisdom and working with the elderly. 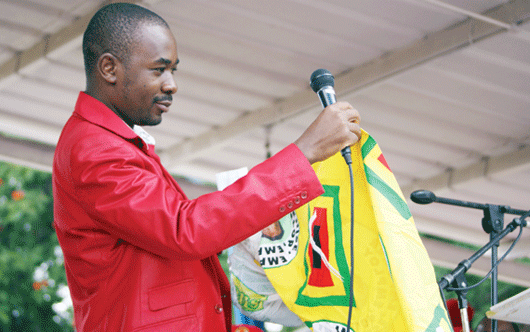 We need elder people in leadership for us to steer the country forward," said Mr Chamisa. Mr Chamisa is a trained pastor with AFM.